The KisanHub Trials Platform is a software service that provides end-to-end experimental data collection, discovery and transfer. By improving connectivity and insight, the platform drives improved trials research whilst enhancing business productivity, marketing tools, and sales. 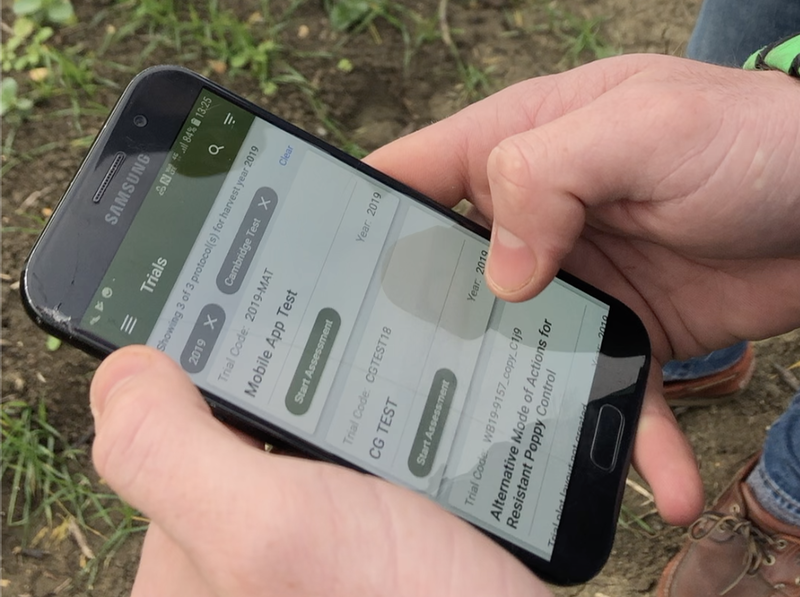 With all the trials intelligence you need at your fingertips, there has never been a more efficient and streamlined way in which to measure field experiments. With the segregation of data from various sources presenting a significant challenge for trials management, the KisanHub Trials Platform brings ‘silos’ of data together for the first time in one place, offering real data integration. By addressing the issue of capturing and recording data required by each team, the platform enables users to upload data directly into the platform, including external datasets. This removes barriers to data integration through software compatibility. The accurate capturing and recording of data is displayed in one user-friendly dashboard, which provides a complete visual overview of the field experiment. Creating intelligent systems and substantive datasets gives your business the time and resources to make informed decisions. With any field trial to be successful in its exploration, time is of critical importance. The KisanHub Trials Platform addresses the issue of delayed responses to field changes, by empowering teams with knowledge at plot level. As teams can make better-informed decisions, the bottom line is vastly improved by reducing time and input costs, and maximising data outputs. With the Trials Intelligence Platform, you know that you are well placed to make the best decisions when managing trials. This is achieved by increasing timeliness of operations and applications, reducing data handling and improving the reporting process. Due to the quality control of data input, the likelihood of costly mistakes and re-assessments is reduced. The construction of field experiments can be entirely controlled on the Trials Platform with the ability to design and manage experimental protocols and plan plot layouts. By providing such tools, the platform enables trials to be set to the organisations required parameters, and enables deeper analysis of the data. Presenting data in this way creates meaningful information that can be effortlessly visualised and shared, and enables enterprises to identify opportunities sooner and view emerging trends. The knowledge gained by such insights can uncover hidden patterns in experiments, and ensure that product selection is based on an informed decision rather than guesswork. The KisanHub Trials Platform enables information to be shared easily and securely, to internal and external stakeholders. This can be for further research purposes, sales insights or knowledge exchange to growers. With collaboration and data sharing tools for research teams, information can be accessed and viewed across departments without missing-pieces that could prove vital to decision making. This can be done through rapid reports, allowing the time taken for trials data to get into the hands of the end user to be reduced. The data can also be pulled out programmatically through our API interface. While it’s important to understand the capability of the KisanHub Trials Platform, it’s business critical to acknowledge exactly how this software will impact the tasks required to run a field-based experiment. We’ve detailed below how the Trials Platform will evolve the current systems and processes you have in place. The undertaking of detailed data collection was once assigned to pen and paper or filling out spreadsheets. But the Trials Platform revolutionises this practice by collecting all data in one repository. Using a laptop or the mobile app, data can regularly be managed without the need for archaic paperwork. Liaising with staff at all levels and conducting discussions on the research project is made easy through the platform. Communication and knowledge are no longer disparate as everyone can collaborate on the platform to ensure all stakeholders are aware of changes and needs. Confidentiality and data sharing are all controlled by the secure permissions system. So whilst segregated data can be brought together, the sharing facility for confidential information ensures that collaboration is supported by all teams involved. Planning, preparing and organising field or lab-based trials is revolutionised by using the Trials Platform. Trials can be designed within the system and geospatially located on the map, allowing field plots to be laid out in the most efficient way. Analysing, writing and presenting reports has been made more convenient, as automated reporting within the Trials Platform removes the need to do this manually. The dissemination of data is completed by the system, providing clear and insightful reports for all stakeholders. The project management of a trial is made more convenient by giving you the ability to monitor crop growth and trial parameters from your laptop. The visual dashboard and real-time data means that monitoring field conditions in close detail is made more efficient. The KisanHub Trials Platform is the future of creating complete efficiency for enterprises who need to make data-led decisions. Enabling exploration for companies who wish to test plant protection products, new varieties and new agronomy practices. The software aims to make business-sense of systems and processes that can all be managed from one dashboard. If the Trials Platform sounds like something that can help your enterprise enhance its field-based experiments, then request a demo today!